We were looking at alternative investments for last week's Finance Fridays. The thought of investing in wine seemed appealing to many people but they weren't sure how long their investment would last! - Annual contribution to the EU is £340 for each household but the CBI says that all the trade, investment, jobs and lower prices through being in Europe is worth £3,000 to each household. - Remaining in Europe will create an extra 790,00 UK jobs by 2030. - Being in Europe give us cheaper supermarket prices, cheaper flights to Europe and lower mobile phone charges whilst travelling in the EU. - Free trade agreements with 50 countries around the world. - We'll be free to trade with the whole world allowing us to seize new opportunities which means more jobs. - Scraping VAT on energy bills will save the average household £64 a year. - Leaving the EU would allow the exiting of the Common Agricultural Policy (CAP) and therefore lower food prices. 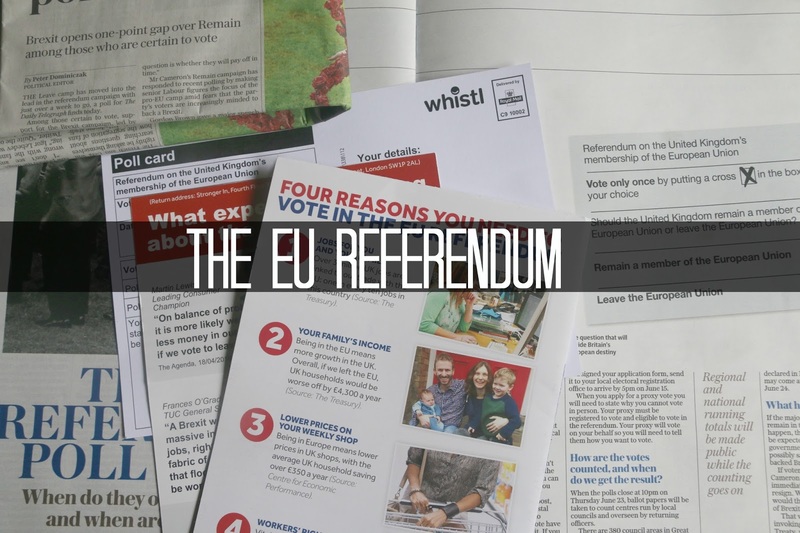 Have you thought of the financial implications of being in or out of the EU? Will you be voting next Thursday? If you want to join in with this week's Finance Fridays then add your link to the linky below. Any post concerning financial matters is allowed. Full details here. It doesn't have to be published today as you have until 23.55 on Tuesday 21st June 2016 to join in. Really difficult to decide which way to vote....strong arguments for both sides. Really need to make a decision soon as not long to go!! I am still in two minds of which way to vote there are so many good and bad things for both that its hard to weigh it all up. I think the problem working out the finances is that everything is so interdependent that's it's difficult to come up with accurate figures. We're still undecided, with conflicting arguments, and reading through this post, there are pros and cons for both sides. It's going to be a very different UK in a few days time. Financially speaking is one thing. I think Britain on a whole would wholly benefit from staying IN. I have had the wonderful luck and experience of being able to live abroad for 10 years (In Barcelona, CAT) and its an experience that I know has enriched me greatly. I am now fluent in 3 languages. I have exposure to other ideals and cultures and I have bettered my career. I suffer with lupus and have had the top best health care I could ask for (all public and FREE). I pay my taxes here and contribute, the same as any EU "migrant". In my opinion jobs etc go the best candidate and the most experience. British people or not being "priced out". I benefit from having this experience and being welcome opened armed by my EU family and can't be more grateful for the experience. So financial or not, Britain are set to "gain" and be richer by staying within the EU. Ps most of the laws passed in the UK are set by the British parliament, it is only 7% of the laws created by the EU that are enforced on the UK. I have really wrestled with this one and have been both vote leave and vote remain over the last few weeks, as I can see clear benefits and drawbacks from both sides. However I am leaning more toward remain now. It has been hard to get to the facts and clear honest opinion - I've had to sift out the scaremongering which is a shame. I wish both sides would just present their arguments clearly and factually instead of trying to manipulate, so thank you for a clear and unbiased post.